With costumed heroes and villains filling the showcase floor at Hartford Comic Con Sept. 19, Dave Dorman takes a moment to sign a print of Luke Skywalker for one lucky Star Wars devotee. If you’re a fan of Star Wars, Indiana Jones or Alien, then chances are good you know Dorman’s photorealistic cover work. 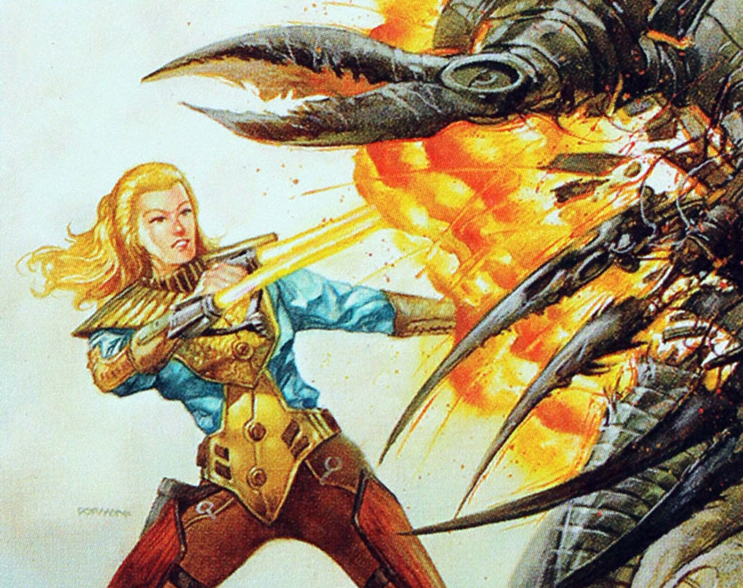 But before he began his prolific collaboration with Lucasfilm, the Eisner Award-winning artist also contributed artwork to a number of fantasy and sci-fi games, including Magic: The Gathering, for which he painted more than 100 cards. 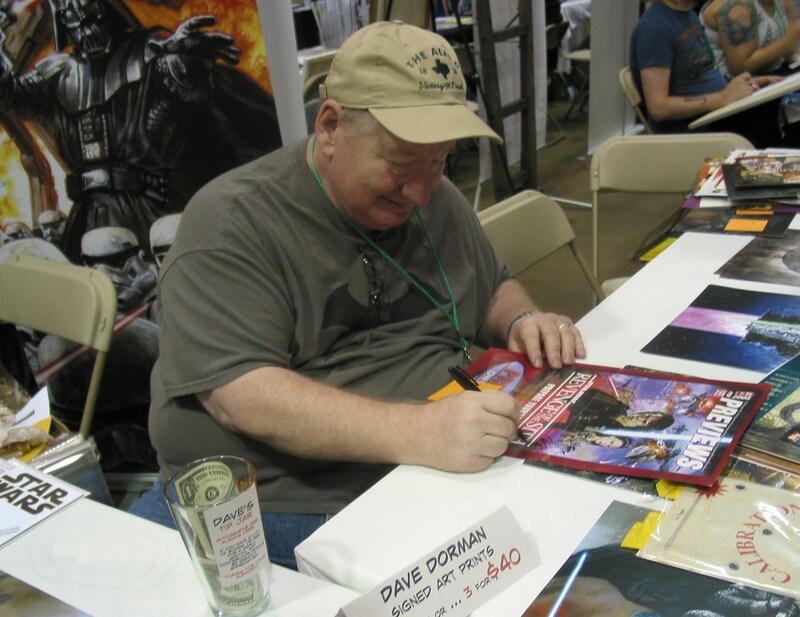 Dave Dorman signs an advertisement for Star Wars Episode III: Revenge of the Sith at Harford Comic Con. “I think I did, just off the top of my head, maybe 120 paintings,” said Dorman during a break from his booth. Beginning in the mid-1980s, Dorman was asked to do some interior art for a few Dungeons & Dragons modules. These led to more assignments for the game, including interior and cover paintings. 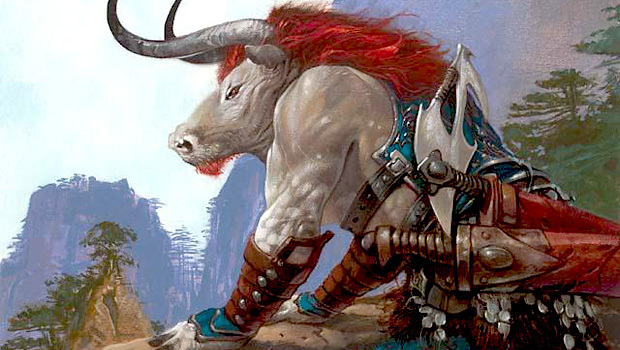 Eventually, an art director from Wizards of the Coast approached Dorman about contributing artwork for Magic. Dorman agreed, and his first paintings appeared in 1999’s Mercadian Masques. Dorman explained that he would receive a synopsis for his assignments, along with a “bible” of the plane or story into which the card was meant to fit. If the card included a central character, like Hanna, Ship’s Navigator, Dorman would have to ensure that his depiction of the character conformed to the basic style guidelines that had been set forth by Wizards. As time went on, Dorman got a reputation for being able to paint realistic depictions of fire and explosions. Some of his favorite assignments include Din of the Fireherd and the Player Rewards version of Pyroclasm. One Magic painting that sticks out in particular is Charging Troll because of the way Dorman produced it. Usually, he paints a background, lets it dry, does the next layer, lets that dry, and then finishes his detail work — a process that takes approximately two days in all. But Charging Troll was finished in a marathon single sitting. “That was fun to what we artists call ‘work wet on wet,’ when the paint is still wet and you’re still adding to it. I’ve never done that with a painting before. And I just sort of got into a groove and just started laying that paint down,” he said. Another painting that Dorman found particularly rewarding was a card he knows as “Overlook Minoutar,” because it allowed him to create a very sedate piece with a lush landscape and an interesting color palette. The card in question? Minotaur Explorer. So why does Dorman know it by a different name? “One of the things that I found after working with [Wizards] for a little while was that they title the cards when they’re initially working up the sets, and then quite frequently they change the title of the card when the set comes out. So I’m constantly asked if I did this card or that card, and 90 percent of the time it’s not the title I knew it under,” said Dorman with a laugh. This sometimes leads to entertaining guessing games as fans describe their favorite Magic art and Dorman tries to figure out the name of the card based on its working title. Still, he said, all of his paintings were reproduced faithfully on the cards and all were received favorably by fans. “I continually sign cards nowadays, even thought I haven’t really done any in seven or eight years,” Dorman added. And just what has been filling his time since Dorman produced his final Magic paintings for the Morningtide set? Star Wars, and lots of it. Dave Dorman speaks about his art and work history during a panel presentation at Hartford Comic Con. 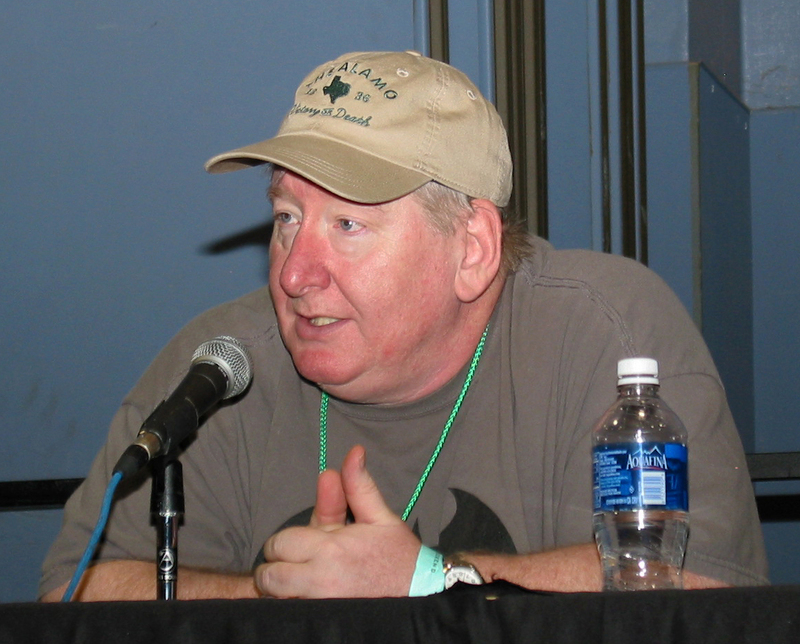 In a special Q&A panel at Hartford Comic Con, Dorman spoke extensively about his Star Wars work, especially the books, comics and games that he produced for the old Expanded Universe (now known as Star Wars Legends). He’s also working with Marvel Comics to produce covers for several of the new Star Wars titles, which he hopes will lead to a relationship with Lucasfilm’s new owner, Disney. In addition to his Star Wars work, Dorman is painting some personal pieces with an aim toward doing a gallery show. He also has his proprietary graphic novel, Wasted Lands, which was nominated for an Eisner Award this year. And he’s thinking about getting back in touch with Wizards of the Coast. “When I stopped, I was involved with a couple of very time-consuming projects, and so I had them take my name off the list. And I’ve just never really officially got back to them and said, ‘Put me back on the list.’ That’s something I probably should do because I do have a lot of fans in Magic gaming, and it would be fun to do some more,” Dorman said. Which leads to yet another vital question: With cosplayers walking around dressed up as everything from Ajani Goldmane to Darth Vader, who does Dorman think would win in a duel between the Planeswalkers of the Magic Multiverse and the Jedi of Star Wars? How is artwork selected for mtg? artists send their portfolios to the MtG art director and if their work is good they will be contacted for specific freelance work. They are given a brief for the card/s they have been assigned to paint, with art direction and access to the style guide of the world they will be working on.